The MCC has issued picture cards to clarify its dress code, as reported by The Telegraph. In the Pavilion and Long Room at Lord's gentlemen shall wear "lounge suits or tailored jacket and trousers, shirt, tie or cravat and shoes with socks". 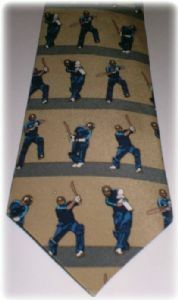 This helps maintain standards which have been in place for hundreds of years and the MCC tie is certainly a great British tradition which will be around for some time. To make sure you will be guaranteed entry to all the top sporting events this year, why not visit Tiesplanet.com to ensure that even the most difficult steward can be evaded every time!